This hybrid design has an inner sleeve of hand-crafted mahogany made by using the new series 'e' curing process. Its outer housing, machined from aluminum then chrome-plated, utilizes a special processing and casting method to increase the porosity of the alloy. This combination of wood and metal insures that the earphone chamber has no 'ringing' which might obscure detail or add coloration. The way the wood and metal housing moves air and reacts to sound vibrations is virtually unaffected by transient distortions. Grado has also designed the cable for the PS1000e; the twelve-conductor cable design uses UHPLC (Ultra-High Purity, Long Crystal) copper, improves control and stability of the total range of the frequency spectrum. The PS1000e also has a new 50mm driver and a newly re-configured voice coil and diaphragm design, resulting in unsurpassed speed and accuracy responses. The cushion design creates the correct balance between the driver and housing to support the desired musicality. The cushion design also makes the PS1000e one of the most comfortable headphones in the world. Grado has taken all of their knowledge and over 60 years of experience in controlling resonances and eliminating distortion. Includes 3.5mm mini adapter and extension cable. Please note we do not accept returns on headphones priced at $650 and up. 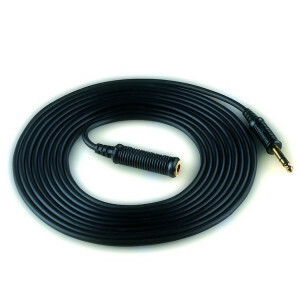 15 ft. extension cable for all Grado headphone models. 1/4 inch ends. .. Allows two headphones to attach to one headphone output. 1/4" ends. ..